Acetylation of histones is a crucial post-translational modification involving the transfer of an acetyl group from an acetyl CoA to the ε-lysine located near the amino terminal of the targeted histone proteins. This reversible modification is carried out by a set of subcellular enzymes located in the nucleus known as histone acetyltransferase (HATs) and it is an important process linked to gene expression and euchromatin. 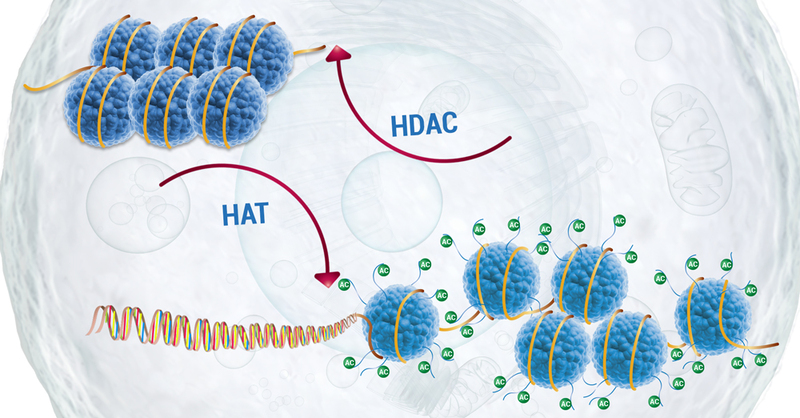 Understanding the need for transcription through various cell signaling cascades, HATs acetylate the histone proteins neutralizing their positive charges, which reduces the strong affinity between negatively charged DNA wrapped around histones allowing transcription factors to bind easily on DNA regulatory sites and easing the gene expression. Alongside, HATs also promote the binding of bromodomain-containing proteins to the ε-N-acetyl lysine motifs. Scientists at Signalchem understand the importance of HATs in research including cancer and inflammation and the respective drug discovery projects. Our recombinant HATs are of superior quality and are ready to be used for your acetylation assays and epigenetic studies.